Pike, like any fish, have a swim blatter, and when air temperatures start to change, this also effects the water temperature down below. And because of this, they first need some time to adapt to new circumstances, wich tells you why they don’t feed much at certain times like this. Water temperatures can all of a sudden plummet by four or five degrees. This counts for every water type, wether it is big or small. There are always places where Pike find shelter and the fishing might be better, such as harbours, bridges or docked boats, where the cold winds can’t reach, but I tend to avoid these places as an open water angler, because if you handle correctly, you can still catch them in the open, and below I will describe how that works. The solution is quite simple actuall: White belly lures!! The Cisco Kid, blue back, white belly flash. Perfect for cold-front conditions! What it is about it I don’t know, but during cold fronts, white belly lures always produce fish. It might have something to do with the reflection of the lure in the water during cold days. Lures that carry this are most often bright and shiny. Remember that I wrote in another article about contrast? We’ll that’s just how it works now as well. Often, an east or north eastern cold front during the fall can be recognized by high skies, bright light and sunny conditions. 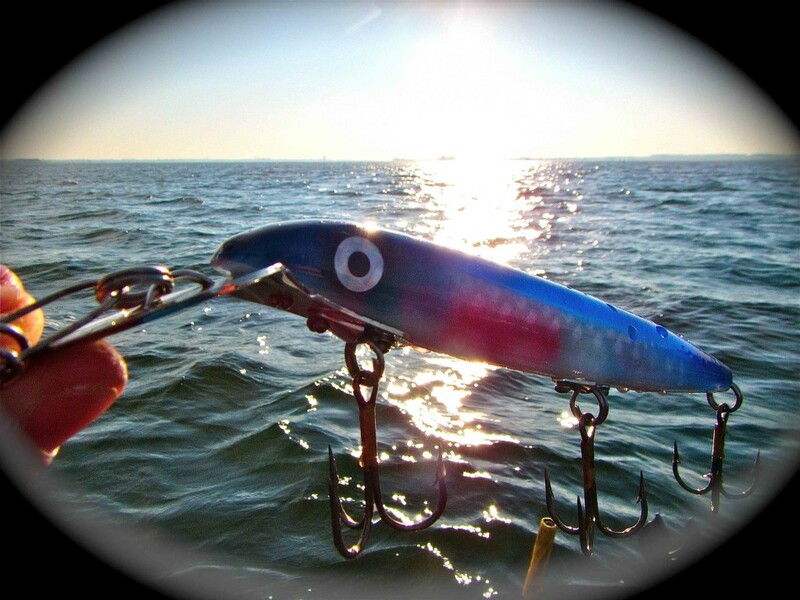 When these things are present you can easily adapt your fishing to the situation by using blue coloured lures, or lures that carry any holographic flash in them. You might have already noticed during your visit to the local tacke shop that there aren’t many lures available on the market that carry this colour on them. There are only a few that match this. One of my favourites are the Cisco Kid 600 in Blue/Silver, the Jake in 8” Holoform Silver Shiner, the 8” DepthRaider in Shimern’ Shad and the big 9” Ernie, in Holoform Perch. Ernie, Jake & DepthRaider. 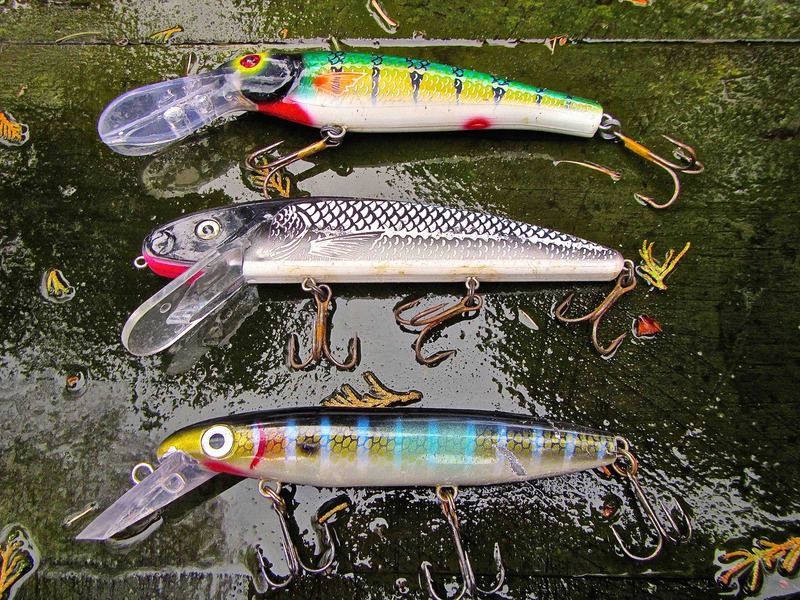 First class white belly crankbaits! But what is it that blue / white holo lures seem to catch fish during these type of conditions? The answer is belly flash. If you would be in the situation of a Pike, with your eyes are faced upwards, and looking towards the surface of the water, you will notice that the baitfish carry a reflection of the light on their back, wich in colder water is often kinda blue coloured. 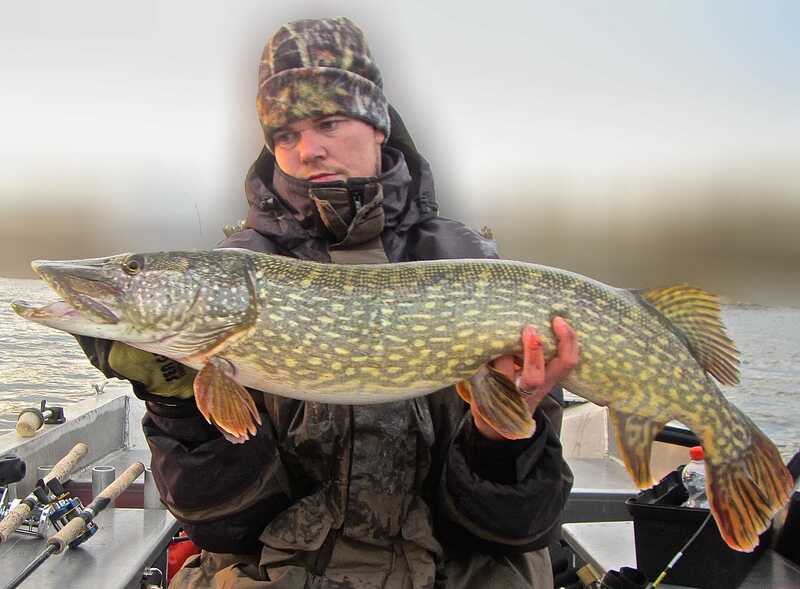 That’s why blue lures work so well in colder conditions. Same goes for ”white belly” lures, they carry the same reflection as the blue backs of baitfish, but now from underneath. I use blue lures in clear water conditions, and white belly lures in more turbid waters, cause white is more visible to fish in coloured water like this. You can also use chrome lures, if you don’t have anything else. Cold front conditions, they can be hard to fish, but if you handle correctly, there’s always a reward in the end! This 41” fish took the Cisco Kid 600 on a cold day!